It’s a Week of Kirby Mania on Wii U Virtual Console! Summer may be half over…but everyone’s favorite pink blob is coming to the Wii U Virtual Console this week to ease your woes! Kirby is a strange little critter who almost never fails to put a smile on players’ faces—when they’re not throwing controllers across the room, that is—and over the years, Nintendo has released a nice array of titles for your gaming experience. This week, Kirby’s Epic Yarn (2010) and Kirby Mass Attack (2011) hit the console, for $20USD and $10USD respectively. If you missed a chance to buy and play these adorable titles in the past, this is a great chance to get your hands on them. In Kirby’s Epic Yarn, you play a platformer with some interesting gameplay features that we saw again in Yoshi’s Woolly World. 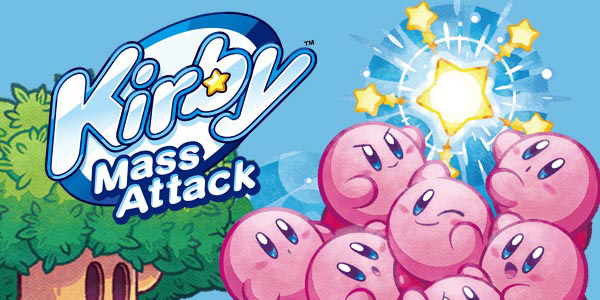 Kirby Mass Attack was an action-style game that resembled Pikmin in the way that the player controls up to ten Kirby at once (Kirbys? Kirbies? What is the correct plural?!). Check ‘em out on the eShop on Thursday!